Marsh-Billings-Rockefeller National Historical Park, though petite in acreage, has a significant role. Why? It presents in microcosm core issues for thinking about land stewardship, forests and landscapes, ecosystems and taking care of our country’s natural assets. 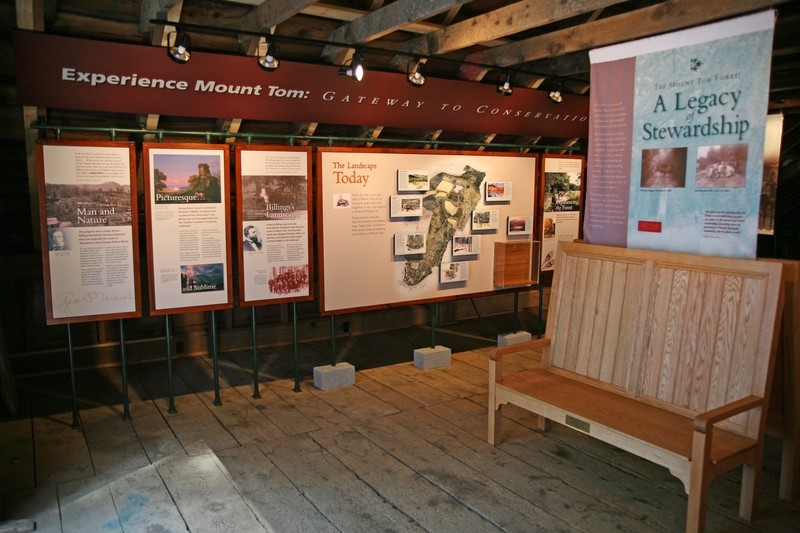 The “historical” element of this National Park teaches the nineteenth century groundwork for the National Park concept, as well as the early roots of what became the “environmental movement”. As part of its mission, this National Historical Park also fosters grass-roots conservation planning and education. Policy makers and nonprofits in woodland ecology have onsite workshop space to confer on evolving concerns and new ideas. Woodstock Vermont, a sightseeing gem in its own right. Near the interstate. Yes, the Park’s name is a mouthful, but access is not complicated at all. It’s a quickie ride from I-89 or I-91, an easy side trip if driving has got you bonded into the shape of a car seat and you need to take a break. This post is a companion piece to an article on the adjacent (and complementary) Billings Farm and Museum. You’ll want to see the Park and the Farm during your visit. This senior hiking group at the Pogue has been hiking together for 27 years, all over the US. The best way to get a handle on this mini National Park is to take a walk. Muddy Boots recommends a gentle ramble up to The Pogue, a beautiful and serene lake, on a historic carriage road. The route is well-graded underfoot and you’ll have an hour or so to feel for yourself how a healthy forest nurtures and sustains its creatures, itself, and you. Wear sturdy walking shoes to keep your footing: this is a dirt road in woods. Take water. Muddy Boots uses trekking poles for efficiency and balance. You’ll make your way among trees with thriving upper and lower stories, big ones and skinny ones, deciduous and conifer, ferns and coverts for small (and large) creatures. Feel the damp of rotting trunks, mosses, fungi, and leaf mulch. Enjoy the dappled light, the little brooks, and the clearings. All contribute to sustain the forest. There are signs of humans in this space, as well, old stone abutments, and recent thoughtfulnesses, all integral to the evolving forest. Inscription in the woods near the carriage road to the Pogue. If you’re not sure how to find your way to the Pogue, the route (to the right just inside the Marsh-Billings Rockefeller National Historical Park grounds) is well-signed. You can download a trail map or pick one up at the onsite Visitor Center (or at Billings Farm and Museum where you will have parked). Approach the Marsh mansion. Wander around the grounds and gardens. You won’t need an entrance fee or your Senior Pass for exploring here. You may like to tour inside the house with a Ranger. If you’re lucky, you can get a spot by signing up inside the Visitor Center. Best, though, to reserve in advance. For the Marsh mansion tour, you’ll need your National Park Senior Pass and approximately $5 (at the discretion of the NPS). A Vermont Youth Conservation Corps trail crew? Well, they exactly belong there, sustaining the forest for the benefit of all creatures, flora, fauna, and homo sapiens. The Vermont Youth Conservation Corps also epitomizes the educational vision of Marsh-Billings-Rockefeller: it provides social and leadership skills to young people who may not have had easy lives. They learn from hard work and come to thrive in woods. You’ll see woodland animals at this Park. Farm animals? They’re across the road at the Billings Farm and Museum. Be sure to say a special hi to Ranger Lynam while you’re visiting. She authored “Treasures on your Doorstep”, a book (review here) on the less well-known properties in the National Park System. You have a Senior Pass, correct? If you’re 62+ and still don’t have your National Park Senior Pass, what’re you waiting for? Cough up the dough and start using the perks! (See Buy Now Or Cry Later: The National Park Senior Pass Price Is Going Up). You should be leaving today with a new sense of how to understand ALL our National Parks. You’ll want to tarry and explore Billings Farm and Museum, across the road from Marsh-Billings-Rockefeller. Recommended: Woodstock Farmers Market (more a grocery/deli than a farmers’ market, and it’s open all year). For a change of theme and topic, tootle over to the next nearest National Park facility, Saint-Gaudens National Historic Site NH, perhaps only 25 miles away in the Connecticut River valley, mostly interstate driving. Orient yourself at Sculptures, Tripe, Covered Bridge: Exit And Explore Saint-Gaudens VT-NH and All In A Day Fall Foliage: Upper Valley VT-NH. There’s a Cabot store and tasting outlet at nearby Quechee. Photo credits. 2nd from top… Marsh-Billings-Rockefeller Wood Barn Exhibit: Public Domain by NPS. Fawn: Public Domain by Vladimir Kudinov via Unsplash. Cabot Cheese Sign: CC BY-ND 2.0 by Ann Dabney. All others..©DustyCarMuddyBoots.com, All Rights Reserved.